Regular inspection avoids damage and ensures consistent high-quality machining results. BIG KAISER, a global leader in premium high-precision tooling systems and solutions for the metalworking industries, introduces the Dyna Force, a device for measuring the retention force of machine tool spindles. The retention force of a machine tool spindle is very important and needs to be checked regularly –potential problems may even result in serious damage to the machine. Regular measurement will reliably identify, in a timely manner, an insufficient retention force of the spindle clamping mechanism that could lead to reduced rigidity and unwelcome vibrations, loss of machining quality and poor surface finishes, and an unnecessarily shortened tool life. By ensuring that the retention force remains at the correct level, as specified in the machine tool’s operating instructions, cutting performance can be reliably improved. "The Dyna Force makes regular measurement of the retention force easy and accurate, preemptively mitigating the risk of machine damage or poor machining quality resulting from a low force on the spindle," said Christian Spicher, Head of Sales and Marketing at BIG KAISER. The Dyna Force is compact and light weight. It includes an easy-to-read digital display, a cable and a robust storage case. 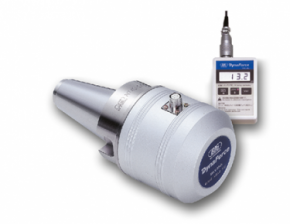 To provide options for common spindle sizes, the Dyna Force is available for 30, 40 and 50 cones, with one common digital display for all taper sizes. It is also fully-compatible with BIG PLUS spindles. BIG KAISER strongly believes that the smooth interaction between all components is essential for achieving superior-quality machining results. Customers are thus encouraged to utilize the company's precise machine testing equipment, which, when used regularly for inspection of machine tools, can reliably prevent damage and noticeably improve process reliability.